“The first herbs of the 2017 season are ready to harvest in our pick-your-own Culinary Herb Garden, located between the greenhouse and the fields. They’re full of flavors to enhance your cooking. We’re again cultivating farm favorites—cilantro, dill, parsley, shiso, edible flowers and sweet basil. Though we’ve had bad luck in the past several years with downy mildew on basil, we’re trying a new variety that will hopefully have greater resistance to the disease. We’re hoping for enough basil to be able to give out both in bunches in your share and as pick-your-own, so that you can make your favorite pesto. In addition, we have perennial herbs including two kinds of sage, savory, sorrel, marjoram, oregano, thyme, garlic chives, chives, tarragon, lovage, lemon verbena and rosemary. The herbs in the Culinary Herb Garden (immediately behind the greenhouse, where you see the wind sculpture) are available for you to pick yourself. As with other pick-your-own crops, they can be harvested on the day you pick up, or one day later. All herbs are labeled, and any herb ready for harvest will have a yellow sparkled star placed next to the herb label to indicate that it can be picked. Please only harvest where you see the yellow stars! Herbs’ readiness for harvest depends on a variety of factors, and all herbs will have their chance during the season. Chives and chive flowers are now almost at the end of their harvestability before they go to seed. Chopped, these go well in salads or as a garnish for eggs or dips. 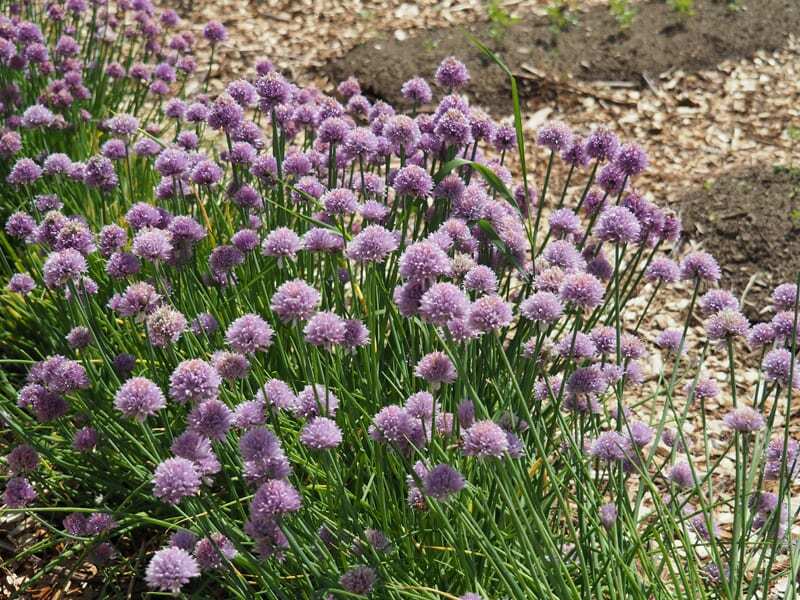 Chive flowers make great butters or vinegars. Oregano has a robust flavor that pairs well with most foods. Try it in breads, marinades, as a seasoning for vegetables and beans, or as a pesto. Medicinally, oregano can be used as an anti-bacterial and anti-fungal agent, as well as to relieve bee stings. It also has anti-inflammatory, antioxidant, and anti-parasitic properties. We have both Italian and Greek oregano growing in the bed. Sage flowers are in full bloom right now, and they need to be picked, so that the sage plant’s energy will go into leaves to use all season. Sage flowers are beautiful and can be used the same as sage. Picking herbs requires care in order to preserve the plants and enable them to continue to grow. Here are some general rules for harvesting your herbs in order to ensure the plants remain strong and keep growing through the entire season. You will find information about harvesting specific herbs on the chalkboard by the kiosk at the entrance to the herb garden. Never pull at herb plants or tug them with your hands; you might pull out the roots with the stem and prevent the herb from growing more leaves. The herb garden will be open frequently so you can pick fresh. Please only harvest what you can use in a given week. If you’re hoping to dry your herbs for the winter, pick a little every week so that over time you collect enough while still leaving fresh herbs for everyone to share. Please be sure to fully supervise your children who are helping you with harvesting. If you ever need assistance or are unsure about how to pick a herb please ask a farm staff member for help. Look forward to to meeting you in the Herb Garden!